Through the years, we have showcased many dozens of sweeping contractors. The sweeper machines in their businesses have run from the largest street and municipal machines to the smallest of tow-behind and slide-in units. Our featured contractor this month breaks new ground: Although the owner has been successful in running a parking lot sweeping operation for the last eight years, his company doesn't have any machine sweepers machines whatsoever. None, nada, zilch. 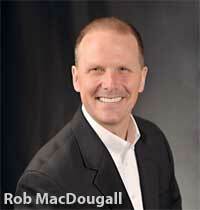 Before Rob MacDougall started his sweeping company he did an extensive amount of due diligence. Meeting with a variety of property managers over an extended period of time – especially managers of big box stores – he researched what they liked and did not like about the current sweeping companies they employed. "When I started," said MacDougall, "I really did some research on various parking lot companies. Without exception, they all did their work with mechanical sweeping equipment; in other words, with some type of sweeper truck. I felt that was a huge hole in the typical sweeping company's business model since there are so many costs associated with running those types of vehicles. Just the maintenance and fuel would have to represent a good portion of their budget. "What I did to test my theory of operating a sweeping company that would do the work by hand was to interview potential customers. I went out to, for example, Walmart and talked with their managers. I wasn't trying to sell them anything; rather, I wanted to find out what their concern was with regard to having a clean parking lot. In nearly every single case I found out that it wasn't removing sand, but rather was keeping the lot clear of paper, cans and other unsightly items. I continued to think to myself 'why can't I do that by hand?' I actually honed my business model for about a year before I put it into action." The essence of MacDougal's business model is that, by employing hand litter pickup versus vastly more expensive machine cleaning, they will significantly reduce the costs per cleaning. Gone are all insurances besides liability. There is no sweeper purchase cost or repair. No consumables in that regard, either. In addition, by subcontrating out to independent contractors for a flat cost per cleaning, he sidesteps the workers' comp. and related costs, including needed office space, sweeper storage area and more. If the hand-cleaning model could provide the quality of service required by his customers, reasoned MacDougall, he should be able to visit each of his customer's property more often and thus minimize the time any unsightly debris might stay on site. To see how he illustrates that point, we offer a PDF file that contains a press release MacDougall distributed in the Des Moines area about his company. To give his business model a try, MacDougall obtained an account and set out to clean it up simply by picking up visible debris and putting it into a bag. Although this worked okay, it was both time-consuming and quickly took a toll on his body. So, he investigated what other debris removal options might work and settled on a sort of 'dustpan on a stick' that was available at Home Depot at the time. This he modified so he would be able to attach a garbage bag to the back end of it, a system that many of his independent contractor cleaners use to this day. Our basic selling point to our customers, says MacDougall, is this: If your current sweeping contractor is cleaning up your property 2 or 3 nights a week, we can clean it up for you 4 or 5 nights per week at the same price. This leaves your lot cleaner and, overall, your customers will see your property as clean more of the time. And, to take any of the risk away from you, the customer, we will perform two weeks of service to make sure you like what we are doing. If you are not happy with the results and do not want to keep us on, then there is no charge for those two weeks. MacDougall says like any other service business he has, over time, received a few service complaint calls from customers. "I would be dishonest if I said I had never gotten any complaints through the years," said MacDougall. "That being said, I have never lost a customer in the eight years I've been in business. I don't necessarily attribute that to the fact we hand-clean, though, but more to the relationships we have built up through the years." Because Iowa is located in the snow belt, as you might imagine there is a significant amount of sand that needs to be picked up in the spring. Crown Property Maintenance, not having sweepers, does not purport to tackle that debris. Instead, they arrange with one or more traditional power sweeping companies in the area to handle spring cleanup and, if needed, to do the same in leaf season. This methodology, says MacDougall, gets the needed job done and keeps his customers satisfied. MacDougall is clear that he does not believe traditional, machine-based sweeping services are obsolete. Rather, he has discovered what he believes is a niche market that a certain segment of parking lot sweeping customers prefer. There are times and situations, says MacDougall, where a traditional, machine-based sweep is clearly required. When that is the case, we make sure the customer gets the type of cleaning needed to keep their property in good condition and looking good for its customers. MacDougall also makes it clear to his clients that if they need a special cleanup, because management brass are coming for an inspection, a special event is scheduled or for other reasons, they should give his company a call. "I include in my business model a willingness to perform occasional special cleanups for clients at no charge," said MacDougall, "at least until a client's requests start coming in on a regular basis. And, if the independent contractor who normally does that particular account is unable to perform the work then I handle the cleanup personally. Our goal is to keep our customers satisfied in every way possible. My customer's best interest is my best interest." When asked about his use of subcontractors, MacDougall said he is very comfortable with the arrangement, as are the people who are doing the work. "The subcontractors appreciate that their requirements are not rigid in terms of time," said MacDougall. "Rather, they know which days each account needs to be serviced and take it from there. Since they do their own scheduling, they are able to schedule around personal events like kids/grandkids soccer games and so forth. My typical subcontractors have a handyman background and a desire to make some extra income on top of whatever else they are doing." In the approximately 33-minute audio interview with Rob MacDougall, you will hear details about everything written above and more. Note: The audio interview with Rob MacDougall will play without downloading any files onto your computer. If you hear the interview at 'chipmunk speed,' you will need to download the latest version of Adobe's free Flash player. Crown Property Maintenance, LLC may be reached via email sent to crownmaintenance@yahoo.com. You may also reach the company by calling 515.314.5802. The company's website is located at www.parkinglotsweepingservices.com/.